Reading about classic Chevrolet cars I learned that there is a consensus about the flamboyant, excessive automobile designs of the late fifties. 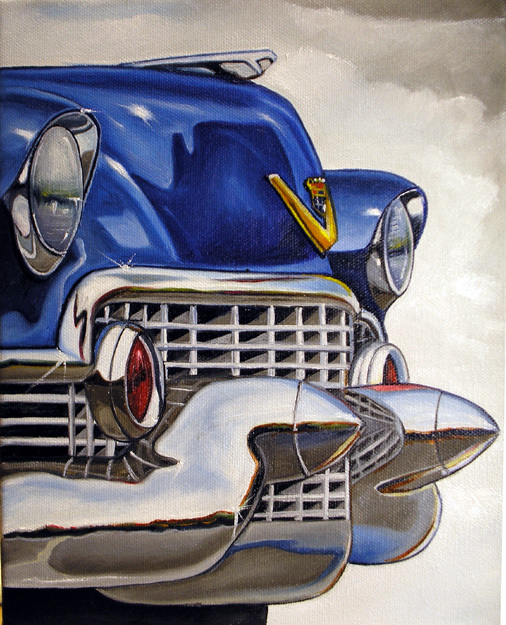 A 57 Chevy calls for a stylish match in terms of pictorial representation, and Vic aptly offers grotesque viewing angles and close ups that emphasize the magisterial metallic bodies, which have long been lauded to epitomize an entire era in post war America. 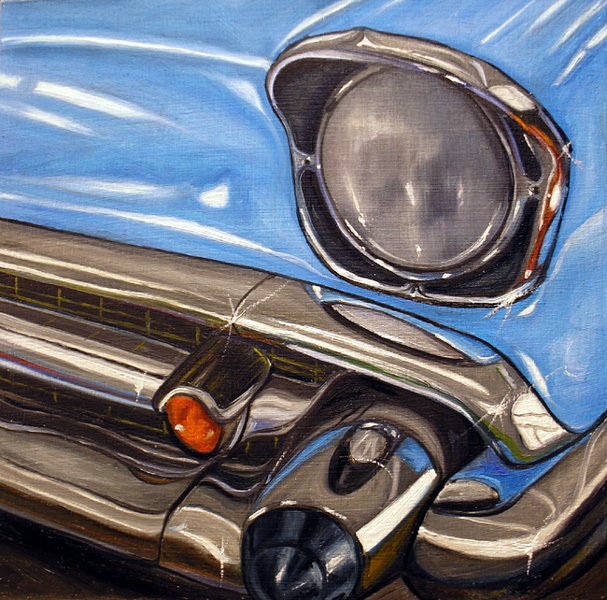 That these cars are now sought for collectibles reflects a nostalgia for that era — and the artist probes into the collective sentiment, as well as partakes in it: his paintings remind why these machines are so irresistible, and how much care and affection they elicit from their owners and admirers, in either actual or painterly form. Paradoxically, these are the artist’s “slower” pieces. An atmospheric patina of in detailed introspection distances the viewer from the images, in a way disclosing the narrow specification of the subject matter but, simultaneously opening a pathway into a world of mechanical and engineering complexity — as a reward, for those who would be willing to claim it. There is an interesting parallel between the process of restoring and painting a classic car: besides painstaking execution, both reproduce an iconic model, nearly from scratch, both involve manual labor and getting the hands dirty, either with grease or paint and, finally, the result in both consists of a shiny new auto. The difference, of course, is in the number of dimensions. Painting only replicates restoration, just as art imitates life, but in this particular case, the common cause of paying a tribute to the theme brings the two spheres closer together. I think that a series of paintings does even further in that direction: almost every piece focuses on a single detail or part, as if recording an actual restoration in progress. Surely that would be a very laborious recording (compared to photography, for instance) but, surprisingly, it would make sense — everything about these cars is excessive — and such an artistic finale brings about a logical conclusion to the mechanical melodrama. In conclusion I would like to discuss how composition here differs from the artist’s food and other still life works. If in those paintings he sought to include and unify, here the objective is almost proportionally opposite. The close-ups exclude the rest of the body and, they literally exclude the uninitiated (consolidating the camaraderie of the experts). He lingers on the separate parts in a display of what I find no other term for but “analytical painting,” so elaborate and accurate is the rendering. Indeed, the next step for the viewer would be to “induce” the entire car from the depicted detail. And is there a more direct way to engage our imagination and mind? amazing art work of the different models of cars.